Lebanese telecoms minister Marwan Hamadeh has called on the militant Hezbollah movement to hand its weapons over to the Lebanese government. 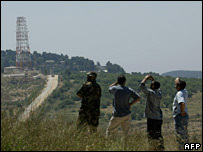 The dispute over the fate of the Hezbollah weapons arose after exchange of fire on the border between Israel and Lebanon on Sunday. A truce between the sides was mediated by United Nations officials. channel al-Jazeera that resistance to Israeli occupation should take place not only from Lebanon, but also from Syria. He was recently summoned to appear in front of a Syrian military court. Mr Hamadeh said he did not support the dismantling of Hezbollah, but he thought all the defensive abilities of Lebanon should be in the hands of the government. President Emile Lahoud said he opposed the incorporation of Hezbollah fighters into the Lebanese army. The anti-Syrian parties in Lebanon announced yesterday that they thought there was a security breach in Southern Lebanon, and that the army should be allowed to "fulfil its missions" there. The UN has called on Lebanon several times to deploy regular forces in the south and along the border with Israel. But President Lahoud said he does not support such a move "as long as we are in war with Israel". President Lahoud was also quoted in Lebanese National News Agency as saying that "Resistance is the only way to overcome Israel". The agency also reported today that Israeli airplanes continued flying today in Lebanese skies, one day after truce was achieved. 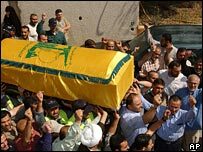 Also today, the funeral of Hezbollah militant Youssef Mohammad Alaeddine, 36, was held today in his southeastern village of Sohmor. On Sunday, Israeli jets targeted guerrilla bases in Lebanon and killed two militants, in response to rocket attacks on northern Israeli bases. The opening salvo came when Katyusha rockets were fired across Israel's border towards a base on Mount Miron, some 20km (12 miles) from the Lebanese border. This was the first rocket attack on northern Israel since December, and the rockets were thought to have travelled further into Israel than in any previous attacks. Israel withdrew its forces from southern Lebanon in 2000, after an 18-year occupation. But there is still a small border area known as the Shebaa Farms, where confrontations break out regularly. The UN has ruled that the area belongs to Syria and says its fate is linked to the Golan Heights, but Hezbollah disputes this.